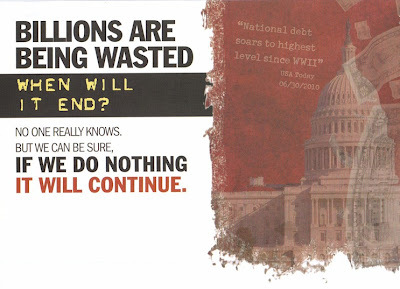 I had just received a mailer from the Republican National Committee today and saw a giant hypocrisy - the GOP want me to vote this election because they fear that doing nothing would destroy America and allow Democrats to spend us into oblivion. This is interesting coming from the self-proclaimed party of "No." I also found it interesting that they attack Democratic spending while ignoring their refusal to touch military funds and their constant flip-flopping on senior citizen entitlement programs.